Alice Marie Johnson was so inspired by Kim Kardashian West's efforts to spring her from a life prison sentence that she wants to help Kim do the same for others. 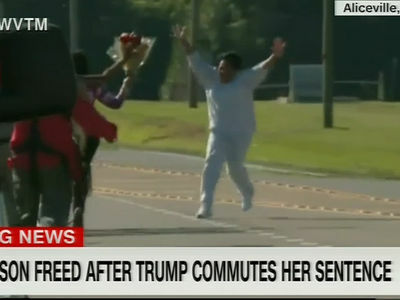 We spoke with the 63-year-old great grandmother, and she told us Kim was truly the difference maker in President Trump's decision to commute her sentence. Not only did Alice offer love and praise for KKW -- even calling her an official member of the Johnson family -- Alice says she's down to help Kim in her fight for prison reform and to free anyone given unfair sentences. As we reported ... Kim's been on a mission for Alice for months, working and communicating with Jared Kushner and Ivanka Trump even before the White House meeting. As we first reported, Alice even sent a heartfelt thank-you note to Kim last year ... long before her freedom was a done deal. We also asked Alice what she's most looking forward to outside of life behind bars ... let's just say it's nothing money can buy.